BRANDON, MB – The review reads, “The audience was smitten with pianist Matthew Peavoy” – high praise for a first year music student from Brandon University (BU) debuting with the Red Deer Symphony. Peavoy performed the first movement of Mozart’s Piano Concerto No. 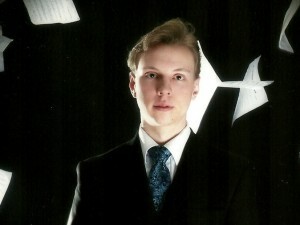 9 in Alberta after winning the Symphony’s concerto competition. The Red Deer Advocate noted he “proved to be a fluid soloist capable of bringing out the delicate lyricism of this buoyant composition”. Peavoy, originally from Red Deer, previously performed with the city’s Symphony in 2008 as a 14 year old classical accordionist. He entered BU last fall, choosing the School of Music because of its strong national reputation.